I was that mom today that bought her kid a pack of Tic Tacs in the checkout aisle, just to keep him occupied. It was all I could do to keep him from ripping down everything from of the magazine rack, grabbing every item on the candy rack, or the conveyor belt with my stuff on it. But I put that magic box of Tic Tacs in his hand, and he shook them and waved them around with delight. And, the teether that he is, he put the box in his mouth. I had to pry the precious box out of his hands to give to the guy to pay for it, which was met with the quickest batch of crocodile tears I’ve ever seen. Luckily that was short lived. 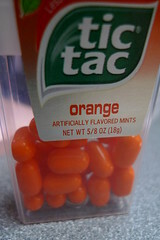 I don’t even like orange Tic Tacs.